I skipped pre-conference workshops (they also costed some $$) on the first day. On the next day we had some introducory plenary talks (that I didn’t find so much interesting) and 7 concurrent sessions (each session is 5 consecutive talks on the same topic, all sessions are at the same time but in different rooms). My background is computer science – so firstly I went for session called “AI and computational models”, hoping to hear some fresh insights on how to create consciousness in machine. The first two talks – by Alexaei Samsonovich and Peter Ford Dominey – were not bad! Alexei is developing an AI software that uses the same method for learning as we humans do, and therefore it might be conscious. For teaching the program basic skills he came up with quite an innovative approach – using his students as trainers. After finishing the talk he was asked how long will it take for the software to turn into real superintelligent brain ready to enslave the poor humankind. “It depends on public interest” – he answered. Well, this answer is not enough for me – and for you too, if you want to know if real AI is possible at all or it is just a sci-fi. So I asked Alexei to give an estimate of how long will the development take in hypothetical case of unlimited money funds. “5 years” – so if some mad scientist with a lot of cash in his pocket will become really, REALLY embittered by this world… beware! Peter Dominey demonstrated videos with some cute robots made by their lab. These robots can learn to collaborate on complex tasks, differentiate between roles and help others when needed. The robots were reasking constantly about how to do this or that – so that one participant told me secretly she would slug such robot down to iron crap in first 5 minutes! So irritating it was. Only human could come up with such destructive idea! The robot would not – it doesn’t have emotions – it just cannot feel anger, irritation, envy and other evil spirits that rule our world. The 3rd talk – some stuff about quantum approaches to consciousness – was disappointing – the author admitted in the beginning that he learned he is presenting something almost in the last minute.. so he didn’t too much preparation. The talk was not given – from the very beginning it transformed to discussing with audience the lack of evidence for role of quantums in consciousness. After that I escaped slightly to the philosopher’s session “Consciousness, Representation, and Thought” held in next room. I didn’t understand what talks were about, but I have to commend to the art of performance and passion of presenters… Thanks to Philip Goff and Berit Brogaard – that is how all lectures should be taught! Evening party had free food, paid beverages and a lot of different, interesting and boring, people to chat with. 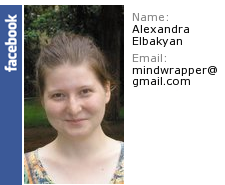 I met one girl with “NanoNeuroscience” title on her badge 😀 My first thought was that she is from Russia – here, to get your research funded all you have to do is to put this “nano-” in your proposal! 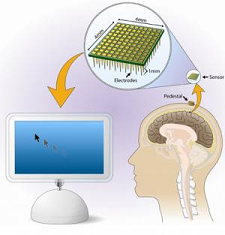 But it turned out that Nancy Woolf is from Los Angeles, and her research is really about nanoscales in neuroscience. Wednesday had a very interesting plenary talk from Dharmenda S. Modha. He analyzed brain connectivity with the same methods as Google uses to analyze the Internet, and found some interesting results. In particular, analysis showed there exists a central hub in the brain, massively connected to other brain areas, that includes prefrontal cortex. There were also concurrents on Wednesday – I kept on running from one session to another but nowhere I could find any talks interesting to me. The fun moment was that some rooms were overcrowded & stuffy, while others had only a few people inside, and even those were sleeping. On Thursday, plenary session was made interesting by talk from from Michael Proulx. I didn’t know before that it is possible to see using your ears instead of eyes. I would also like to mention Friday’s plenary talk by Sid Kouider – he made an analysis of different theories of consciousness, which is quite useful – there is a lot of theories – and their body is growing – but how to select the right one is not yet known. Friday evening had a poster session… there was also a poster session on Wednesday, but Friday’s session was bigger & better, and it attracted more people. Almost every poster was colorful & nice to look on, so I had to turn on my brain and look for worthy content. Amanda DaSilveira found that Brazil people are generally less aware than Americans of what is happening around! Another poster I remembered was by Amna Alfaki – it was just one big paragraph of abstract text, printed on 96×48 inch paper sheet. It really standed out from all other posters 🙂 The content was also interesting – about neurons located in the heart that could have its own conscious experiences… something in support of this old soul-in-the-heart idea. On last day a lot of people came to listen the talk by bestselling sci-fi writer Robert J. Sawyer about consciousness in science fiction. But talk turned out to be more about science fiction vs. science in general. According to Robert, sci-fi writers are scientists who just work on a bigger timescale and do not restrict themselves by taboos on personal opinions and other stupid rules imposed by scientific journal editors. In general, the conference was ok albeit too loaded with information – it started from 8:30am (which incites on replacing some talks with good morning sleep) and went onto late evening, and even with this schedule I had to miss some interesting talks because they were on concurrent sessions. Of course I could by the recording but it is pricey! The thing I very regret for is not taking photos… next time I’ll definitely bring a camera! 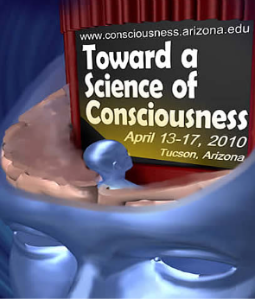 2 Responses to "Toward a science of consciousness 2010 conference proceedings!"